Pennsylvania’s state capitol, with its dome of vibrant green-glazed terracotta tiles presided over by a gilded figure representing the Commonwealth, was the perfect backdrop for the Exhibit Train in Harrisburg. display behind him. The city of Harrisburg has long been an important railroad center, especially in the days when the Pennsylvania Railroad (PRR) dominated the industry in the Midwest and Northeast and was considered one of the largest and most powerful corporations on Earth. In the 1930s, the PRR undertook an extensive program to electrify its busiest East Coast lines. For decades, trains heading west from Philadelphia had to switch from an electric to a diesel locomotive at Harrisburg, where electrification ended. 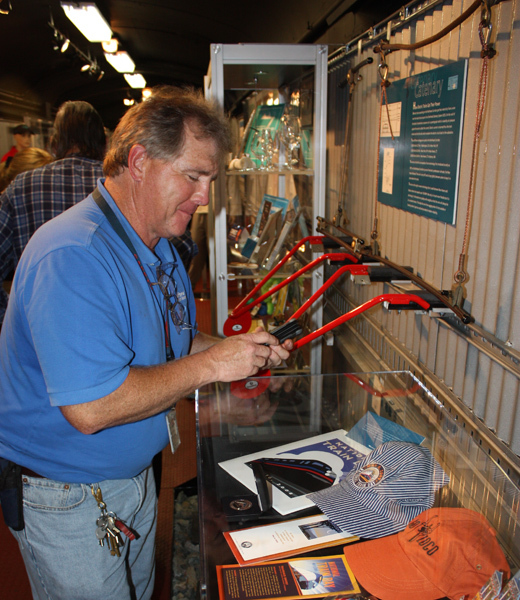 Visitors to the Exhibit Train can see how electrification works today through the mock-up of the catenary/pantograph system used to power our Acela Express train sets. The catenaries are the metal wires that carry the electric current that is then drawn to the locomotive through the pantograph. Usually we only see catenaries and pantographs way above us, so the chance to eye the parts up close is a rare treat. This weekend we were joined by colleagues from the Pennsylvania Tourism Office and the Harrisburg Chapter of the National Railroad Historical Society (NRHS). Similar to many states, the Commonwealth of Pennsylvania is gearing up to commemorate the sesquicentennial of the Civil War and the Emancipation Proclamation. 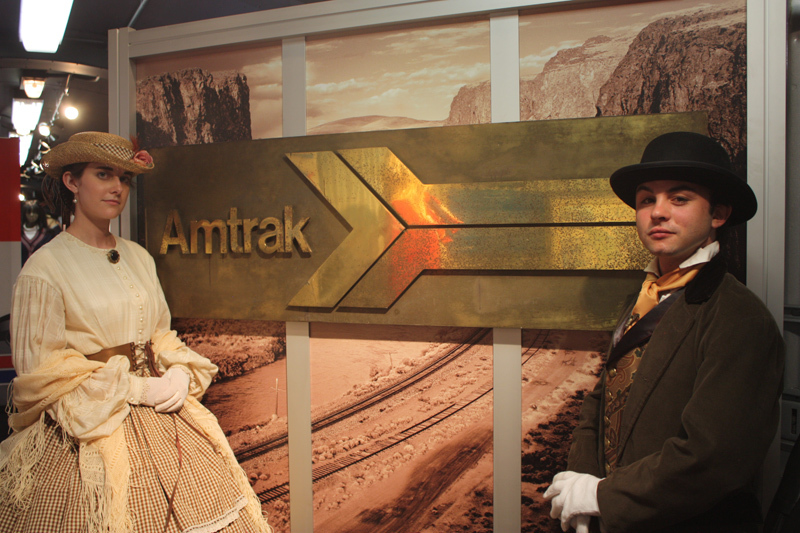 To help people better understand how those on the home front, including African American patriots, felt and understood the impacts of the war and emancipation, living history interpreters in period dress strolled through the station and along the platform to tell stories and show people artifacts from war time. Exhibit Train. The Harrisburg Chapter of the NRHS, chartered in 1959, adheres to the national organization’s goals of supporting railroad related educational and preservation projects. A dozen members came out to help us staff the Exhibit Train, and they also opened up their own GG1 Electric Locomotive and Cabin Car to visitors. Just a few blocks away, the chapter operates the Harris Switch Tower Museum. Completed in 1930, the tower was the main control point for all east-west passenger and freight traffic that came through the city. Railroad staff monitored a large model board that displayed all the tracks and showed the positions of the trains as they approached the city. Throwing various switches, those trains could be guided onto the correct tracks to keep the traffic running smoothly. No longer in active service to the railroad, the tower has been restored through countless volunteer hours. A simulation programmed with PRR schedules from the 1940s allows visitors to try their hand at guiding “virtual trains” onto the correct tracks, which is harder than it looks! Well, they say that the railroad never stops—which means that we’re on our way east to the heart of Amish Country for the next two weekends where we’ll be open to the public at the Strasburg Rail Road. Considered the nation’s oldest short-line railroad, it’s been operating as a popular tourist excursion line for more than half-a-century. See you there!